On 31 May, the European Commission published a reflection paper on the deepening of the economic and monetary union. Henrik Enderlein, Enrico Letta and Aart De Geus outline proposals that they believe should have been contained in the paper. 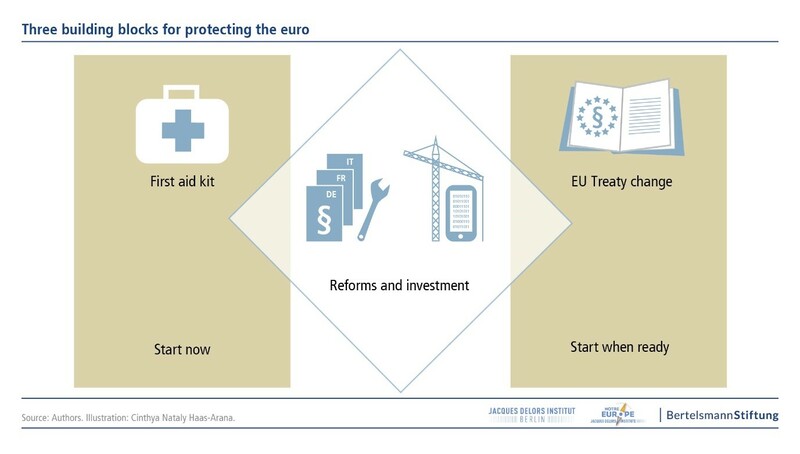 Their plan includes three key building blocks for a lasting and workable reform: a first aid kit, a structural reform and investment agenda, and significant risk-sharing. The election of Emmanuel Macron as French President on 7 May gave renewed hope to proponents of the European integration project after the hammer blow of Brexit and fears about a sustained revival of populism. There is momentum in Berlin and Paris now behind the belief that the euro is incomplete and cannot last without major reforms. We share this view and we also want the single currency to succeed and bring back growth to the euro area. Make no mistake: Europe will inevitably be hit by a fresh economic crisis. We do not know whether this will happen in six weeks, six months or six years. But we fear the European Monetary Union (EMU) will be ill-prepared: too few of the structural weaknesses that triggered the last (and continuing) crisis have been addressed. The European Commission has just published a reflection paper on the deepening of EMU. Here is what we think should have been in the paper: We set out below (and, in more detail, in a joint report) our proposals for a staged but lasting and workable reform. This will be more comprehensive than the previous post-2008 effort that relied excessively on the European Central Bank doing “whatever it takes” to save the euro. European governments must step in, collectively and individually, to build a stronger euro. A revived and more effective EMU must be reconstructed on the basis of both structural reforms and investments. That way the euro can deliver stability, economic growth and political strength. 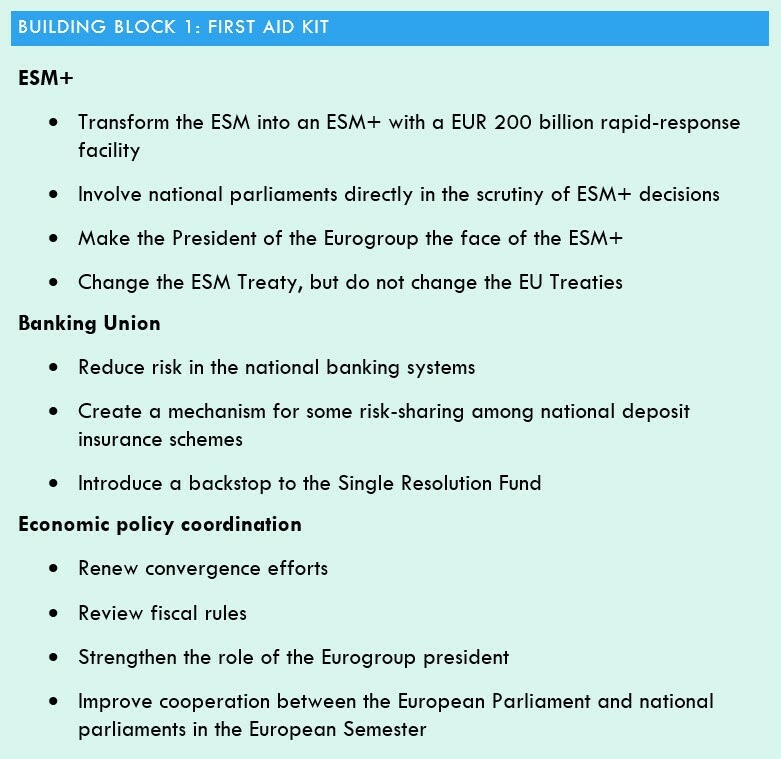 Building block 1: Design a first aid kit consisting of a reinforced European Stability Mechanism (ESM+), an enhanced Banking Union and better economic policy coordination under improved democratic control. We do not have to change the EU Treaties for that. 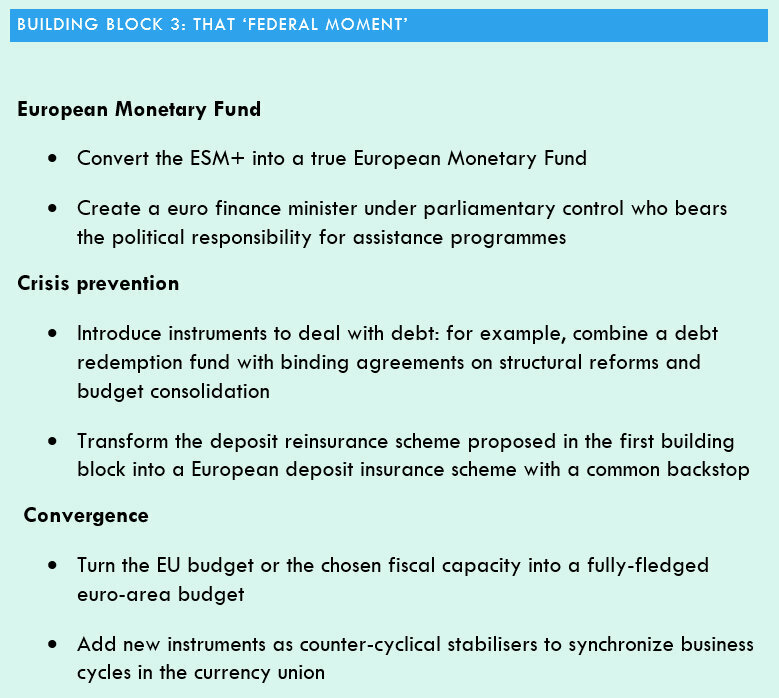 Building block 2: Combine a focused structural reform agenda with a comprehensive investment initiative. We should put a strong emphasis on what member states can do, rather than just shift powers to the euro-area level. Building block 3: Base EMU on significant risk- and sovereignty- sharing within a coherent and legitimate framework of supranational economic governance. We should turn the ESM into a fully-fledged European Monetary Fund and strengthen parliamentary control to enhance European legitimacy. Today Europe does not have a coherent strategy. It is not even muddling through, as often in past crises, when piecemeal solutions took the place of grand strategy but still contributed to further integration. The individual elements are not connected in a consistent manner and make for political instability. Our plan does not call for a European super-state or a transfer union. It sets out a pragmatic solution designed to protect the euro. Because, if the currency fails, the entire European integration project will be in danger. We cannot take that risk. The EU and the euro area especially cannot afford to focus exclusively on the challenge posed by Brexit, significant though it is. Europe needs to protect its citizens by making sure that its economies perform well and the benefits of growth are shared by all. The common currency is an insufficient link in Europe’s architecture. In any new crisis, international market participants might question Europe’s determination to engage in true risk-sharing and sovereignty-sharing to overcome such a crisis. What ultimately stabilised the euro area during the crisis was central-bank action. Yet depending on the ECB alone is economically dangerous and politically unsustainable. Its policies are removed from democratic checks and public deliberation, even if they substitute for absent fiscal stimuli at national level. Consequently, many perceive the rescue measures to lack democratic legitimacy. In 2007, one out of two Europeans trusted the ECB. Today this has declined to one out of three. 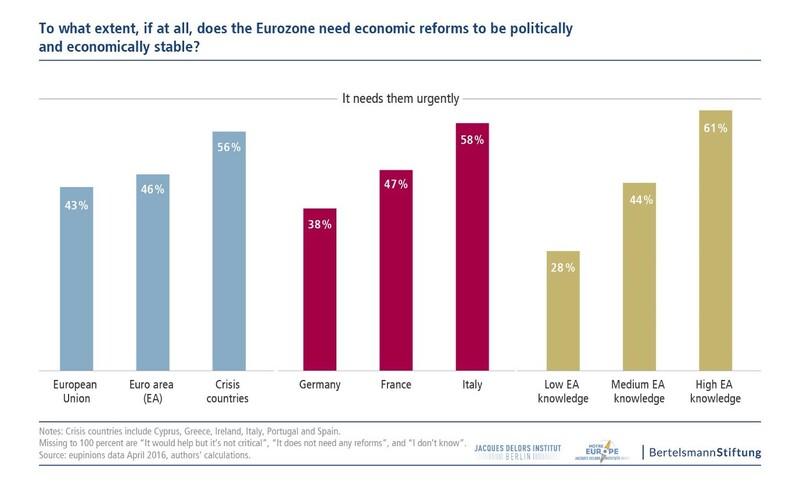 Although confidence in European policy-making has declined, at least a third of citizens think there should be more solidarity among Eurozone countries and another third believe that even if everyone is responsible for their own actions, there should be solidarity in times of crisis. The election of the new French government opens a window of opportunity to reform the euro area. And European citizens want economic reforms. Note: For more information, see the authors’ accompanying report. The euro may now not be in an immediate crisis but that does not mean we can declare it will be stable. Why wait for the next crisis to find out? It must be protected today. Brexit is yet another reason why Europe can no longer afford to keep taking ad hoc decisions on the euro. A credible strengthening of the single currency would be the proof that Europe can solve its challenges even in these difficult times. This would significantly enhance the credibility and resilience of the European integration project. A more robust EMU would not weaken its individual member states. On the contrary, it would strengthen their capacity to deliver the stability and prosperity that citizens are asking for. Let us repair EMU now and prepare it for whatever the future may bring. 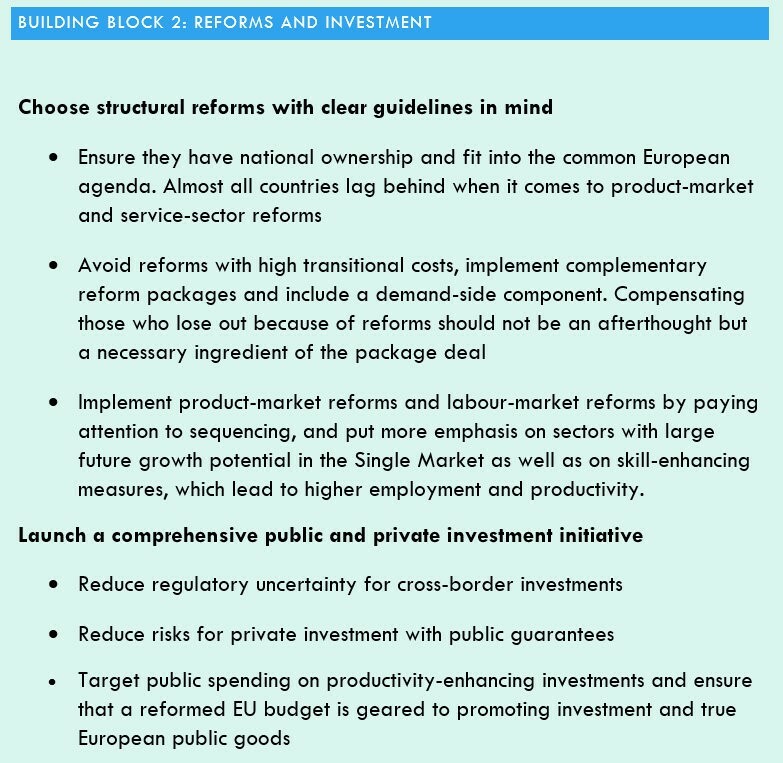 We propose a comprehensive reform strategy for choosing and implementing the right euro-area reforms and restoring growth. We favour an intergovernmental approach as the right way to start the reform process with a limited sharing of risk and sovereignty. Our long-term goal is a monetary union based on a significant level of risk-sharing and sovereignty-sharing within a coherent and legitimate framework of supranational economic governance. If a new crisis arrives, there will be no time to discuss possible solutions. Financial markets will react quickly. This is why Europe needs a first aid kit ready to use. Our kit contains quick fixes for the most dangerous weaknesses. This means relying less on ECB measures and more on a transparent sharing of risk and sovereignty. In addition, convergence and growth should be nurtured from two sides: we need structural reforms to increase cyclical convergence and reduce macroeconomic imbalances – and we need investment to spur convergence and foster social cohesion for a better functioning of the euro area. Ultimately, EMU would be best served with a significant level of risk-sharing and sovereignty-sharing within a coherent and legitimate framework of supranational economic governance. This is what we dub the ‘federal moment’, when crisis-fighting is left behind and replaced by a solid long-term framework designed to provide economic stability and democratic accountability for all EU citizens. It requires the treaty changes hinted at by Macron and Angela Merkel at their 15 May meeting in Berlin. This article is published with permission from the report’s authors – © 2017 Bertelsmann Stiftung, Jacques Delors Institut – Berlin and Jacques Delors Institute in Paris. You can access the original version of the report published on 30 May 2017 here. Original edit by David Gow. Henrik Enderlein is Director of the Jacques Delors Institut – Berlin, and Vice President and Professor of Political Economy at the Hertie School of Governance. Enrico Letta is President of the Jacques Delors Institute in Paris and Dean of the Paris School of International Affairs. He was previously Prime Minister of Italy. Aart De Geus is Chairman and CEO of the Bertelsmann Stiftung. Correction needed in post. The outline of building block 2 is repeated and that of building block 3 is omitted. Thanks Neal, this has been corrected now (the same image for building block 2 was uploaded twice).